I hate cooking, but this cheap $37 George Foreman grill has made me a healthy-eating convert. The cooking hasn't disappointed me yet, the cleanup is easy with detachable plates, and the price of $40 is unbeatable. In a desperate plea to break up my ravioli feedings with some protein, my dad recently sent me this $40 George Foreman grill in the mail. 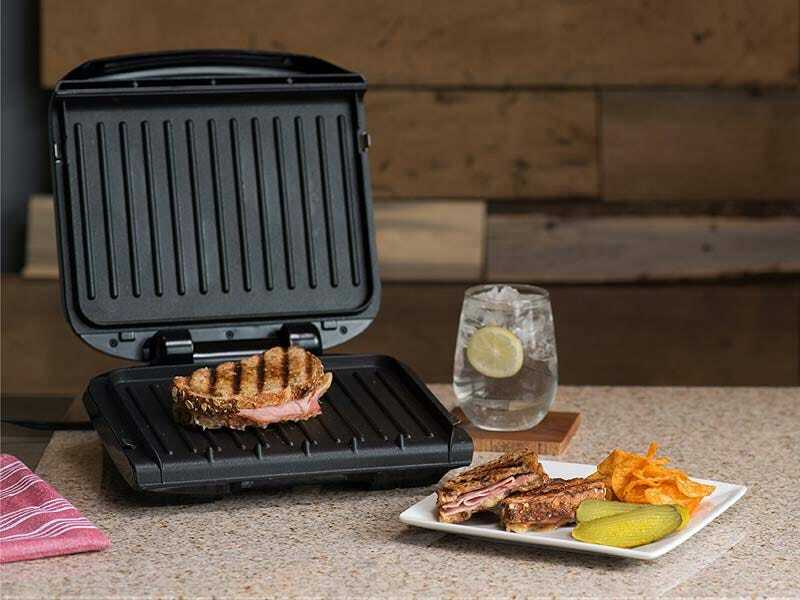 It can cook up to four servings at once in under 10 minutes, the plates are removable and dishwasher-safe for easy cleanup, and you can cook basically whatever you can dream up to grill: chicken, burgers, veggies, paninis. The sloped surface helps drain 42% of fat to make your meals healthier, and this new model supposedly heats up 35% faster than older iterations. And, it's only $37. Some reviews list complaints like a burning smell or wear on the grilling plates, but I haven't experienced either, fortunately. (If you do, though, you'll have the standard 30-day window to return the grill). And while the size is perfect for one to two people, I think it's a stretch to say this little model could suit a family of four. Comfortably, it fits three big boneless chicken breasts. Depending on how big you make your burgers, I'd estimate it fitting three. If you need a larger surface, Amazon also stocks a 5-serving multi-plate system ($94). It's also worth noting that this $37 grill is extremely minimalist: There's no on or off button (it heats up automatically when plugged in and notifies you with a light change when it's ready for grilling) or temperature control, but that's also what I like about it. There are as few steps as possible, and it does everything I need it to (heat up and grill quickly and perfectly) without any intervention from me. All in all, I love it. If you're looking for a way to cut your cooking time in half without sacrificing healthy-eating goals - or, like me, need the lowest barrier of entry possible for the activity - I really can't recommend it enough. And $40, it's not risking much. If you hate it, send it back. If you love it, enjoy (what I suspect to be) another three bonus years of life since you stopped eating coffee and ravioli for every meal.